Before MetroBus service moves back to the Civic Center Transit Center in downtown St. Louis on Monday, August 14, you’re going to get a couple of opportunities to check out the newly-redesigned transit center ahead of time. Metro will hold a public information meeting on Wednesday, July 26, from 11:30 a.m. to 1:30 p.m. at the St. Louis City Hall Rotunda at 1200 Market Street. It will be open-house style so you can pop by during your lunch hour for a few minutes. This is your chance to learn more about the expansion project, which kicked off more than a year ago. You’ll be able to find out where your bus will park at the new transit center and hear about the new customer amenities, including an indoor customer waiting area and passenger restrooms. On Thursday, August 10, at 10 a.m. you’re invited to join regional leaders and others for the official ribbon-cutting ceremony and news conference at the Civic Center Transit Center. There is no Park-Ride lot at the Civic Center Transit Center so if you’re downtown, you can walk, or take MetroBus to Clark Avenue at 18th Street (by the Union Station MetroLink Station) which is just two blocks from the Civic Center Transit Center, or take MetroLink to the Civic Center Station. Here’s where it gets fun. You’re invited to come to the Public Open House on Friday, August 11, from 11:30 a.m. to 1:30 p.m. Fredbird and Louie will stop by and there will be food trucks, live music and an art bus painting. And it gets even better. We’re offering a Ride Free Transit Zone in downtown St. Louis from 11 a.m. to 2 p.m.
Here’s what that means. You can ride the #99 Downtown Trolley for no charge between 11 a.m. and 2 p.m. and you can ride MetroLink between the Laclede’s Landing Station and the Union Station MetroLink Station for free between 11 a.m. and 2 p.m. that day. You can get on the train at the Laclede’s Landing Station, the Convention Center Station, the 8th & Pine Station, Stadium or Union Station MetroLink Station, and take MetroLink to the Civic Center Station to get to the fun and festivities. When you’re ready to head back, you can get on the train for free at the Civic Center Station and hop off at any of the downtown stations. However, if you are travelling outside of those downtown stations, you’ll still need to have valid fare. On Monday, August 14, MetroBus service returns to the Civic Center Transit Center. All 23 MetroBus routes that serve downtown St. Louis will meet at the Civic Center Transit Center connecting bus riders with MetroLink. Four existing MetroBus routes will be split into eight new routes, and these shorter routes will provide passengers with more direct service and better reliability. 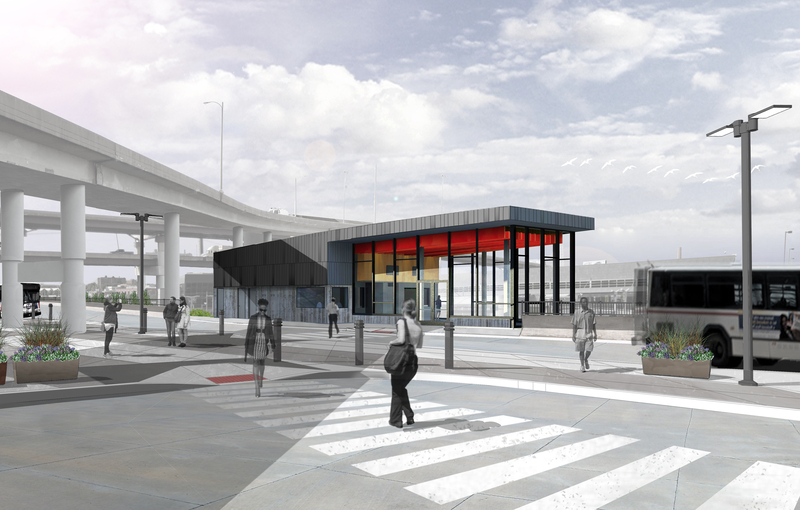 The new indoor customer waiting area with passenger restrooms and digital arrival-time boards will open, and Metro riders will be able to purchase concessions at the transit center. MetroBus personnel will be on-site as well as Metro Public Safety team members. The Civic Center Transit Center was completely redesigned to accommodate more MetroBus vehicles. We also built for the future with 60 foot buses in mind as well as easy modification for electric buses. The old transit center housed six bus bays while the new design incorporates 19 bus bays. Construction began in April of last year. Metro was awarded federal funding for the expansion project, and that funding supported 80 percent of the total project cost of $10.5 million. It seems that the splitting of routes will lenghen a commuter’s ride time by having to change buses to continue on to where the original route took them. Also forcing everyone going into downtown to change to the train is not only inconvenient, especially in bad weather, but adding time to their commute. Sorry to sound so negative but I hear these things from riders and many former riders as the reason they are considering driving or have already stopped riding the bus and train. Ad a retired Metro driver and train operator I think it is a step backward and contributes to ridership decline. R. Eugene, thank you for sharing your thoughts about the Civic Center Transit Center and MetroBus service that will return to the center on August 14. The service plan for this transit center was researched and calculated using various data and feedback from Metro passengers. This research showed passengers that currently use the routes that will split into two routes don’t travel the route in its entirety. In fact, very few passengers traveled the route from beginning to end. These shorter routes will provide better reliability and provide quicker service. While we do expect about a 10 minute layover for passengers who require a transfer, they will do so with better amenities (i.e. restrooms, waiting area, etc.). We’re excited to open the new transit center and provide an even better transit experience to our current and future passengers. Also when you look at it, if you do have to transfer, the new place may have an area to where you can get some coffee on the go. Our summers still have some pollution problems and there are still several cars out there on the road that still pollute badly. With the place being next to the Greyhound/Amtrak station, it is allowing Metro to pick up travelers coming in off the Greyhound bus or Amtrak train to get to their hotels. If this place has a snack bar inside the building, you can stop there on your way to your destination and get yourself some coffee to go. When I used to return home from work and the van would take another client home via I-270, I would look out the window and see many motorists that should be riding Call-a-Ride. Some of them are on their phones while driving or spaced out to stupid stuff on their car stereos. I see no elevator there at the Civic Center station and the area where the snack bar is sitting is up at the MetroBus platform. I like transit but we need to make it easier for wheelchairs to get from the bus to the platform. I do like the idea of some transfer centers having snack bars so that people that do have to wait a while can stop for some coffee while they continue on. Patrick, the Civic Center Transit Center redesign does not have an elevator, but rather a pedestrian ramp for passengers (like those in wheelchairs) to use. And yes, the transit center will include a concession area where passengers can purchase a snack. We’re excited to show it off to the public in August. While this is not related to the new CCTC I would like to see Metro make a genuine effort to improve connections (schedule wise) between their arriving buses and departing trains and vice-verse at the Shrewsbury TC. I suspect with the upcoming quarterly set ice change in August my commute to and from work is going to be one a little lengthier than it already is. John, thank you for sending us your feedback regarding MetroBus connections. We can definitely look into connections at the Shrewsbury-Lansdowne I-44 MetroLink Station, but we’ll need more information about your particular trip (i.e. what two MetroBus routes, what time, direction, day). With your additional information, we’ll make sure that planning and scheduling reviews it, and if possible, makes improvements. As far as the Civic Center Transit Center and the August 14 service change, for the most part, trips shouldn’t be impacted too much. In fact, the transit center will offer more amenities than its earlier configuration, providing comfort and an overall better experience for the passenger. 21 East departing SLCC at 4:30 am. Eastbound BL departing Shrewsbury at 5:13 AM no problem. Afternoons: Westbound BL departing Union Station 2:28 PM arriving Shrewsbury at 2:57 (if no delays) Departing 21 Westbound 21 departs 2:58 PM – this is where the nightmare is. This is not enough time to catch the bus. A few extra minutes between the arriving train and departing bus would be nice. Other than that, thanks for getting me where I need to go on time. John, thanks for the information about your particular commute. I will make sure our planning and scheduling department receives this feedback. If possible, and if resources allow, they may be able to tinker with the schedule ahead of the next service change this fall. Hey John, I sent this to our planners (as I said I’d do) and they’ve informed me that the August 14 Service Change will have changes to the #21 Watson schedule, providing better times at the Shrewsbury Station for you to transfer from rail to bus. We plan to have those schedules available online two weeks prior to the service change. For the thru passenger (not necessarily end to end) on the formerly 40,32,& 30 routes, this is a fare increase. They could get on somewhere in north St. Louis and get off in south St. Louis for $2.00 and vice versa. Now they have to spend $3.00 because they have to get a transfer to change buses at CC station. Steve, yes, you are correct. For passengers who purchase a one-way bus fare and ride the entire route, they will need to purchase a transfer. That being said, we’ve done extensive research on the routes we plan to split and discovered very few passengers actually ride the entire length of the route. In general, most passengers ride from the north into downtown St. Louis or from the south into downtown St. Louis. When we split the routes, we in turn improve the routes’ performance, allowing flexibility and reliability. I did not say the entire route. If you get on at St. Louis and Jefferson and get off at Broadway and Arsenal, it is now a one seat ride on the 30 bus for $2. After the service change it is a two seat ride for $3, precisely the kind of service that drives riders away. Steve, four existing MetroBus routes will be split into eight new routes, and these shorter routes will provide passengers with more direct service and better reliability. We also will introduce new amenities at the Civic Center Transit Center, a request many of our passengers have asked for. We believe these enhancements will improve the transit experience for current riders and future riders alike. My only comment is that the reliability improvement is BS because these routes already have very high on-time performance rates and in fact many times wait to not be early. The 30 usually stops at Soulard Market for this in both directions. Are travel times then being reduced between time points to improve running time and eliminate some of the cushion? Regarding transfer this is why transfers should be free for 2 hours. I will also say that the changes should have been made with public input not change and then get feedback to stop any changes, kinda backwards and says we are going to do this anyway. Also, can a preview of the new timetables be made available? Shannon, thank you for sharing your feedback regarding MetroBus changes coming August 14. The times will not change between time points, according to our transit planners. The bus routes that we are expanding were actually shorter routes if you were to go back in history. These routes were made longer during the 2008, 2009 service cuts. As far a public feedback, we always welcome customer feedback via all our communications outlets. As you may know, the beauty of MetroBus service is its adaptability. Our transit planners have the opportunity to modify service four times a year. If you have service recommendation, we encourage you to reach out to Customer Service. Your feedback, along with our own research, help shape future service. We plan to publish the schedules very soon. Stay tuned.